November 27th, 2014LWSC: Can I have multiple Likno elements in a page and can I have many sliders in the page? 1) if the Web Scroller Builder script can co-exist with the AllWebMenu script on the same page? 2) can I put two sliders (different design) on the same page? First, thank you for your interest in Likno Web Scroller Builder. 1) Yes, all Likno products can co-exist in the same page, thus Likno Web Scroller Builder and AllWebMenus can work at the same page. 2) Yes, you can put as many sliders as you want in your page. To optimize that you will share the same likno-scripts folder for all the sliders so that you only call them once in your page. November 4th, 2014LWSC & LWMW: Can I have a scroller as content of a modal window? Knowledge Base support case for Likno Web Scroller (jQuery Slider) Builder & Likno Web Modal Windows Builder, abstracted and stripped of all user’s private info. My question is can you open a a scroller in a modal window ? Thanks - Anthony, been using allmenus for a long time, just bought scroll builder and modal windows builder a week or so ago. The answer is yes, you are able to have a scroller inside a modal window. The index_lwsc_sample.html holds the scroller. Note, that you could also have selected the "Make certain links/forms in page open in this window" in case you need more pages to be loaded in the same modal window. I have attached a zip folder containing a sample scroller project, the index_lwsc_sample.html, the modal window project and the test.html in which I have linked the modal window. There, I have a link that when you click the modal window appears which has the index_lwsc_sample.html as its content. November 2nd, 2014LWBC: What are the applications that have an Expression Web add-in? Knowledge Base support case for Likno Web Builders Collection, abstracted and stripped of all user’s private info. Can you send me info on just the packages that are supported by Expression Web 4? Right now, we haven't got an Add-in for our other software, but we are always here to help you in any case. 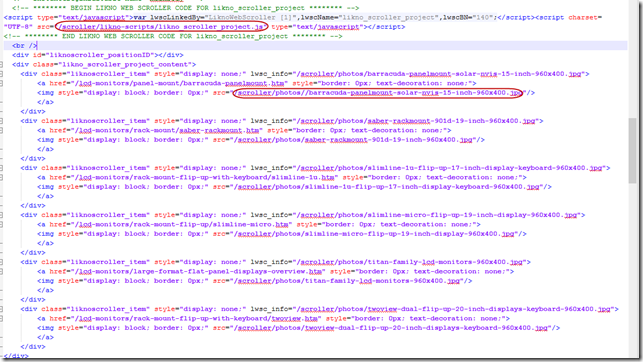 October 15th, 2014LWSC: How can I see a jQuery slider locally on my PC? I just purchased Scroller and have figured out how to make my project. But when I try to Publish, it gives me the wrong paths, so I have to manually fix things in Dreamweaver. I'm sure I'm doing something wrong, but can't figure out what. Also, where should I go for the likno_scroller_project_content? The program supplies the sample page content paths, but not the actual content paths. I've noticed a few bugs, as well. The help file mentions clicking on the "Compile" button, which doesn't exist. I assume it should read "Publish". When I click "Import Images" to add more photos to my project, all of the links (URLs) I've set up for the existing photos are deleted. Very frustrating. I found a typo on the "Sample Code" tab: It's at the bottom of the page--the tick box "sroller separators". First, thank you for your purchase and your feedback. 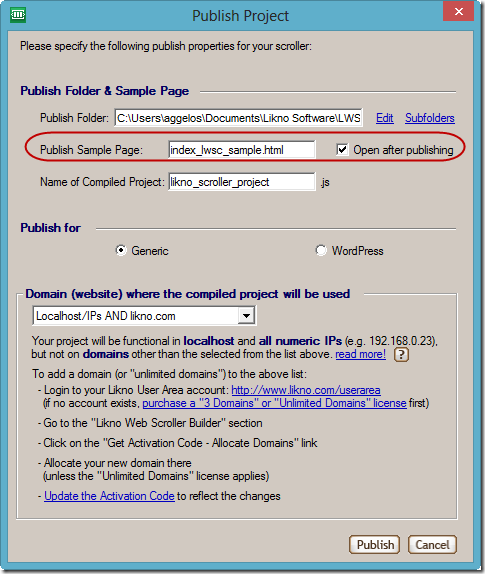 When you publish your Image based Scroller a folder "lwsc_sample_images" will be created in the Publish folder you have specified and it contains the images for your scroller items. So, uploading the compiled files to your server should work as expected. For example you have the www.yourdomain.com, in order to see the index_lwsc_sample.html you need to upload the index_lwsc_sample, likno-scripts (folder) and lwsc_sample_images (folder) to your root folder so after that, opening the www.yourdomain.com/index_lwsc_sample.html should show the scroller as expected. As for the links that are removed after your click on "Import images" to add more images, I will forward it to the development team. Just so I understand correctly (I'm slow): The folders (likno-scripts and lwsc_sample_images) need to be uploaded to our server in order to view the page locally? I thought you wanted to see that slider live on your server. When, you Publish a scroller project, you see on the settings the Publish Sample Page and it is checked "Open after publishing". So, when you have published the scroller project, this page automatically opens in your default browser and you should see the scroller live. Didn't this happen to you? Could you export and send me your project file, so that we can have a better look at the problem. This is what you should do to export your project into a ZIP file and then email this ZIP to us. I was trying to put the code in my page and viewing it locally. I don't want to go live with the scroller until I know it's working--and until the site is done. I have everything in a temporary folder called www.mysite.com/2012 while I design the site. Once I'm ready to go live, it will all be moved to www.mysite.com, which necessitates having relatives links for everything. I've attached the file for you to look at, if you need to. I've also attached the page into which I have inserted the code. I wonder if that is perhaps where I went wrong. Ok, I think I'm good now. Do not hesitate to contact us in case you need further help.